We are at the tail-end of daylight savings, so the mornings are starting to be pretty dark when I walk down to the bus in the morning. Besides the odd funny encounter with possums that I mistake for the neighbourhood cats, the other pleasant side is that I now get to see the whole dawn show from last stars to first heat. The other day, as the bus crested the hill and Adelaide opened up before us, I was struck by how similar the dawn sky behind Adelaide was to the dusk sky I spent so many photos on up at Lake Argyle. I remember the wonder and amazement I felt looking at the ever-changing hues of pink on that day on the lake, and yet I nearly let this Adelaide dawn go unnoticed. It was a beautiful sky and equally as beguiling as that Lake Argyle sunset. Sunset over Lake Argyle. 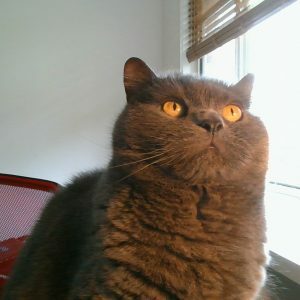 I have not fiddled with the colour in this picture at all. This is what it looked like! I think the biggest difference was I was not looking with my tourist eyes, but my work-fatigued eyes. 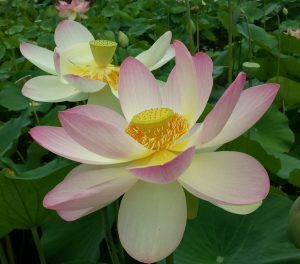 As soon as I started appreciating the beauty of the moment I felt my spirits lighten. I then got off the bus a stop later so I could walk through the mall and appreciate the dawn light in the city; something I rarely get to see. And just for a short while, I felt like I was on holidays. 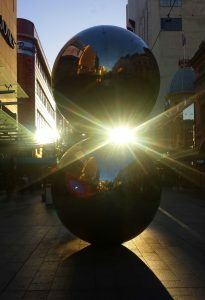 Adelaide’s famous ‘Mall’s balls’ at dawn. 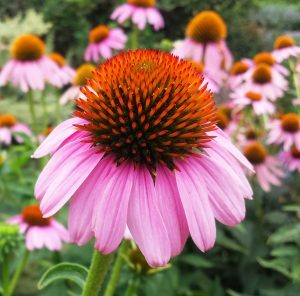 (If you can’t see the pictures on this post, please click on the heading to go to the page). 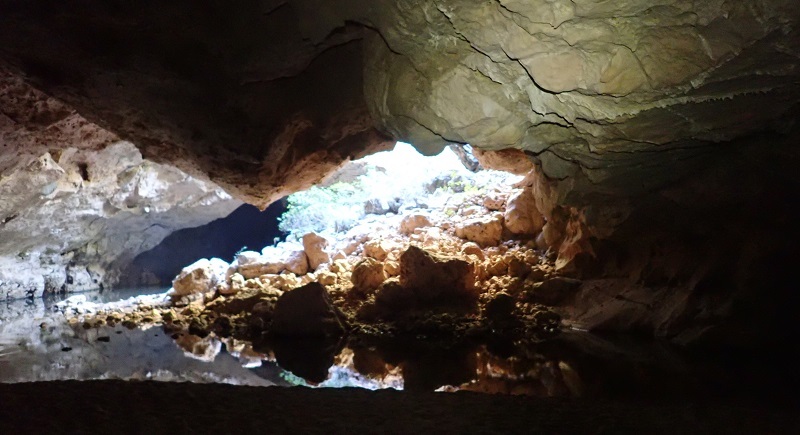 Tunnel Creek, a 750m underground tunnel complete with a crocodile filled creek that you wade through. The falls at Bell Gorge. You can hide down to the bottom and go swimming. We left Broome for the Gibb River Road through the Kimberley. The 4WD bus did a good job of managing the bumpy road, but I have to admit I was amazed to hear the whole thing had just been graded two weeks earlier. I imagine it would be quite a tooth-rattler at other times of the year. We stopped at several gorges along the way, all of which were stunning and all of which involved a hot and sweaty hike, a cold swim in freshwater-crocodile-infested water, then a sweaty hike out. It was brilliant. 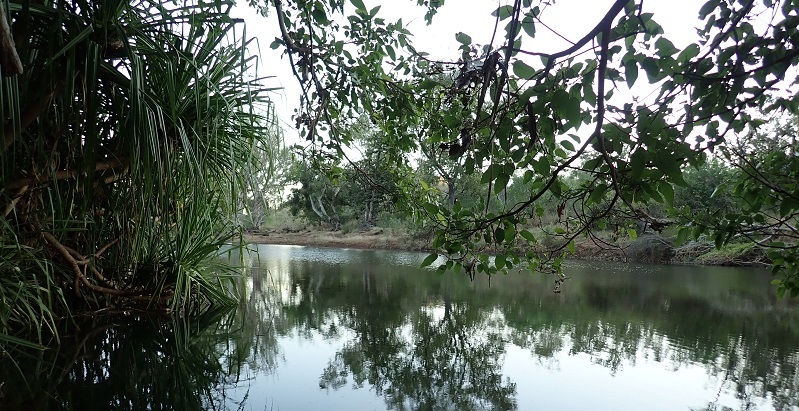 The view from the campsite over Pentecost River at El Questro. I have to dip my hat to El Questro Station as the best campground in the Kimberley. I came to that decision not just because of the beautiful river than ran alongside us, or for the bar with wine that was listed by grape variety instead of colour (yes, one hostel had Red and White as their wine list), not even the washing facilities that allowed us to remember what clean clothes felt like. 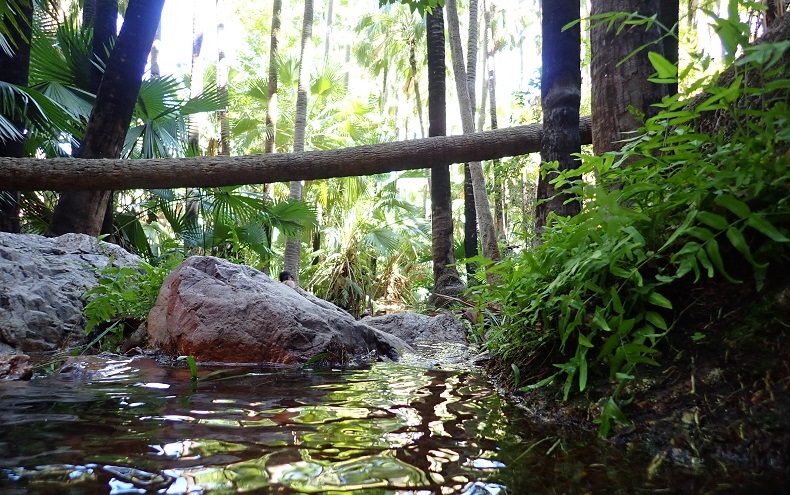 No, El Questro camp ground has fantastic showers. Right temperature, right amount of spray and (crazy concept here) somewhere to put your stuff so it will stay dry as you shower. The domes of the Bungle Bungles in Purnululu National Park. Then it was back on the road and down to the Bungle Bungles. I say that as if they are half an hour away, but the trip was more like 7 hours. Totally worth it. Hiking through the domes was amazing, Echidna Gorge was amazing, Cathedral Gorge was amazing. And just in case I hadn’t had enough amazing, I did a helicopter ride over it all in a helicopter with no doors. A-ma-zing! Bungle Bungles domes from the helicopter. 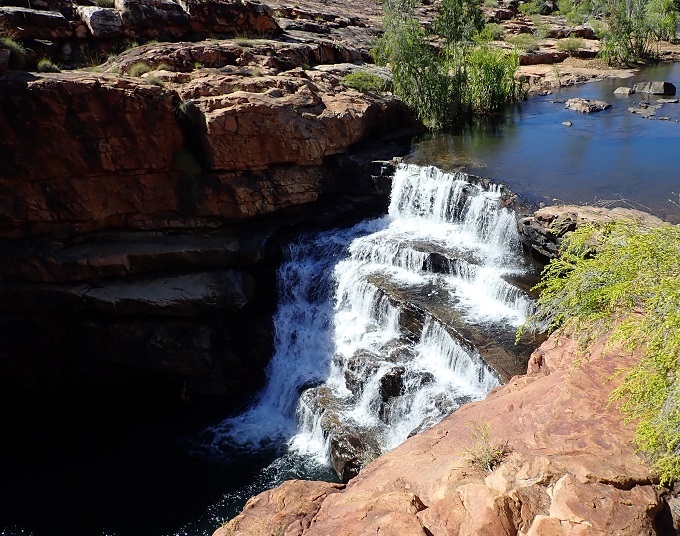 Then we made the dash to Darwin stopping at Lake Argyle for a sunset cruise (beautiful, I had no idea), then Katherine to see Nitmiluk Goroge and finally Edith Falls for our last sweaty hike into a beautiful waterfall-ed swimming hole. Then like that the trip was over. We were in Darwin and I had my flight booked home the next day. I didn’t want to go back. And even after being back for a month… I still don’t want to be back. Cathedral Gorge in the Bungle Bungles. Look down the bottom and you’ll see a person to give you an idea of the size. Western Australia was stunning, and confronting, and challenging, and beautiful, and awe-inspiring, and cold, and hot, and unforgettable. You need to go there. Put it on your bucket list. No, Western Australia, thank YOU! (If you can’t see photos below, please click on the post heading to view in the post page). 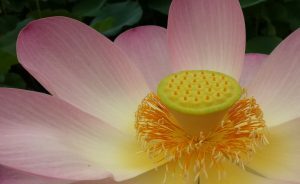 I discovered that my tour was not actually a 22-day tour as I thought, but rather two 10-day tours tacked together with 2 days in Broome between them. 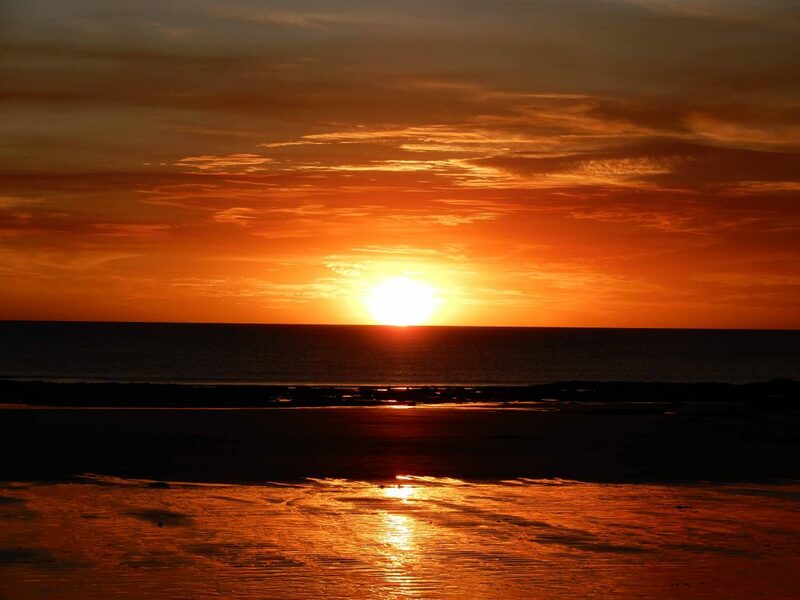 I didn’t know much about Broome, besides the fact that they had more dinosaur footprints there than anywhere else in Australia, and that for some reason people felt obliged to ride camels on Cable beach to watch the sunset. I hate to say this, but I didn’t love Broome. The history was great, but as a holiday destination, I didn’t find it very relaxing. It probably wasn’t helped by the location of the hostel I stayed in, which wasn’t near anything. To go to Cable beach was either a $20+ taxi ride, or a bus that stopped running soon after sunset. If you went out to dinner in the main town of Broome (where the hostel was located) you had to come back down dark streets with no lighting. 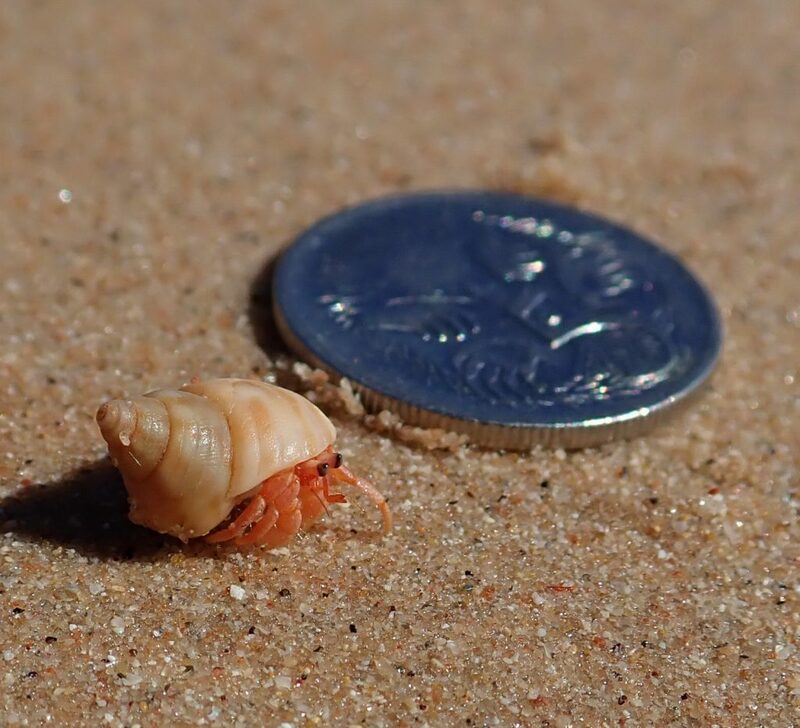 Tiny-tiny hermit crab on cable beach. I was getting changed behind a rock and suddenly all the shells got up and walked away! I’m also not really into pearls, which is the other thing Broome is famous for. Something I was looking forward to was the cuisine. Broom is such a melting pot of cultures that I had heard there were really novel and delicious combinations of food. I’m sure there was, but I couldn’t find it. I don’t think my hostel was really into food, because when I asked about where to eat they directed me to a pizza shop. 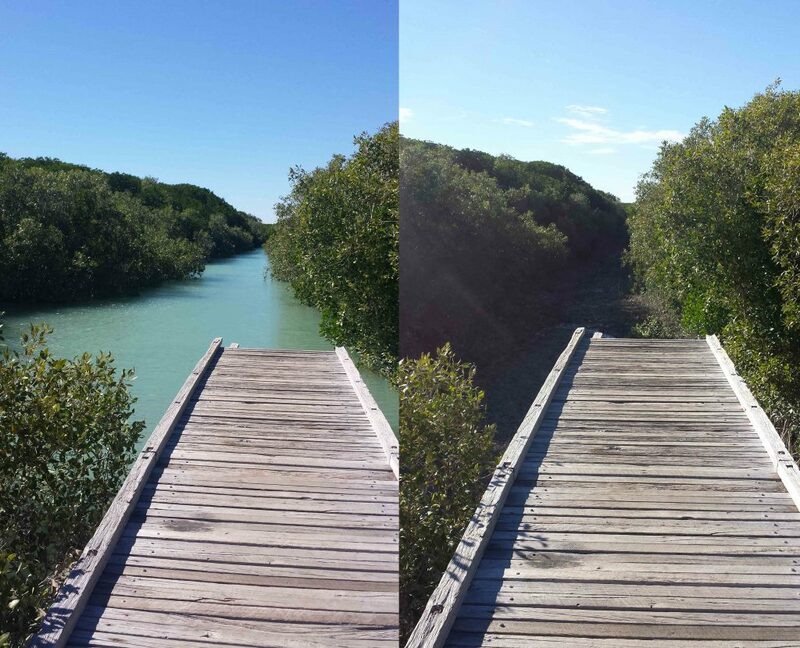 The tides in Broome are massive, up to 12 metres. They were only 10 when I was there, but there is only about an hour between these two photos. Anyway, through amazing good fortune I stumbled onto one of the better mini-tours I have done. I wanted to see dinosaur footprints, but the tides (which are HUGE in Broome) weren’t right for me to be able to walk out and see them myself. 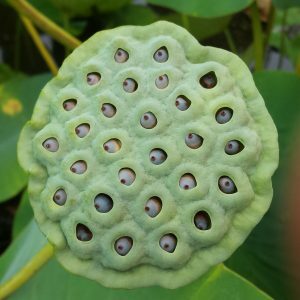 The only way I could see some was on a sunset hovercraft tour. One of only three hovercraft tours in the WORLD it was great to glide over mudflats and ocean with ease in such a unique craft. The commentary was excellent and the guide clearly both knew and loved the place. The footprints were spectacular and plentiful, and the sunset was gorgeous. I think it was a much better way to do sunset than on the back of a camel! 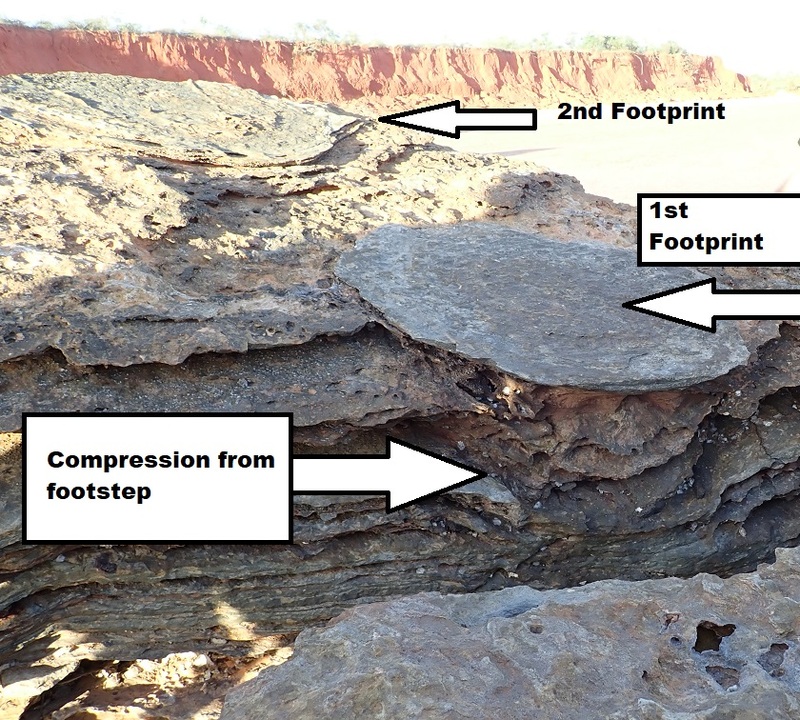 You can see the compression of the ‘soil’ layers under this dinosaur footprint. I think I need to come back to Broome again and do it properly, not staying in a hostel next to the airport. If I do, I will certainly be booking myself onto the hovercraft sunset tour again. 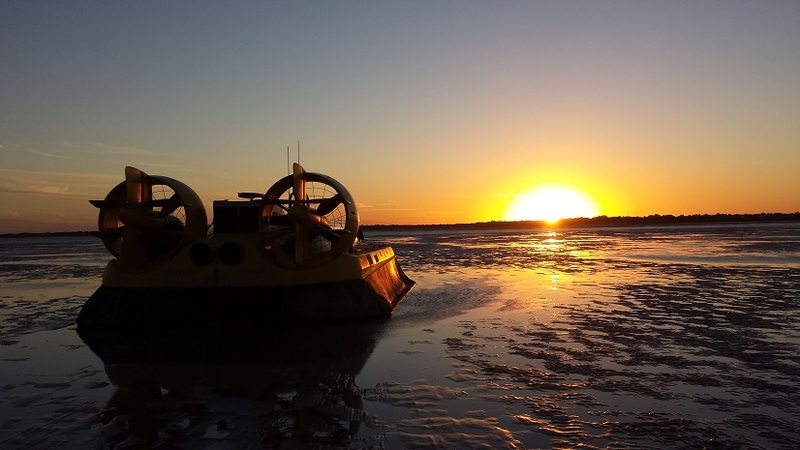 The dinosaur discovery hovercraft tour ends with champagne and a sunset! Next week I’ll finish off with the last 10 days of the tour; Broome to Darwin. That’s going to cover a LOT! Coral Bay – the darkness in the water is the reef. Coral Bay was where I got my first glimpse of Ningaloo Reef. It actually comes right to the shore! You can walk into the water and snorkel over the reef. I elected to take a boat out a bit further so I could get some deep-water snorkelling practice in before my big whale shark adventure the next day. I was glad I did, because it takes a little while to get used to breathing underwater. 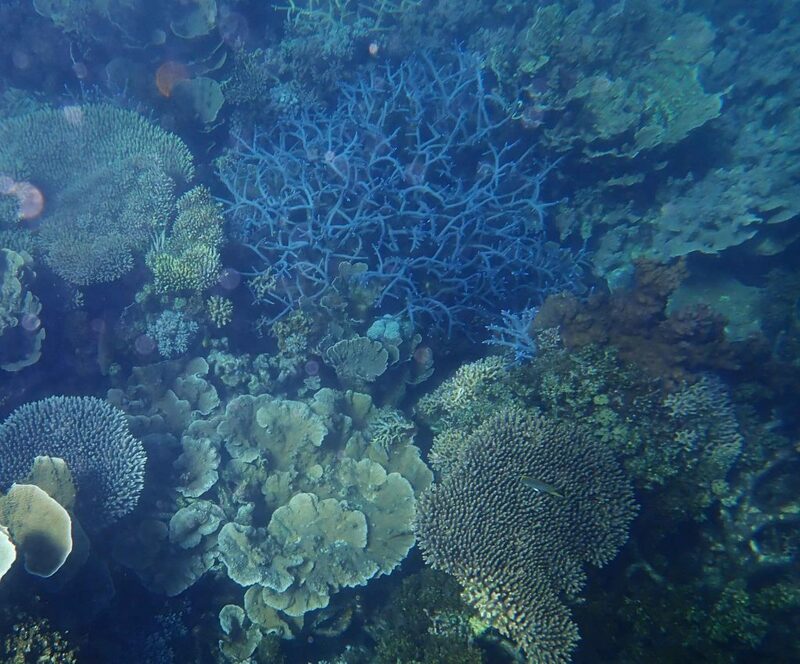 The reef was stunning, but lacked a bit of the colour that I’d seen in the Great Barrier Reef over two decades ago, sadly I don’t think it is still like that now. The next day was the big one. Whale sharks! I will never forget the moment when we were all bobbing about in the water wondering what was going on and the guide told us to look down. 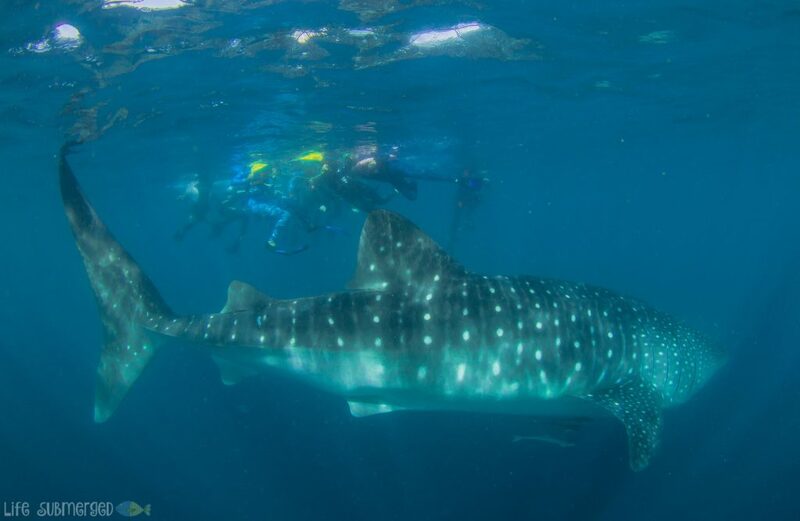 I put my face in the water and was almost eye to eye with a 7-metre long whale shark! I struggled to believe I was really there. The photo below is courtesy of Kings Ningaloo Reef Tours and if you ever find yourself up in Exmouth I would HIGHLY recommend you go out with them. The staff were amazing, and everyone had a fantastic time. I had never heard of Karijini National Park, and if I’m honest I stopped reading the tour itinerary once I established I would see stromatolites and swim with whale sharks. As a result, I was not prepared for the amazing beauty that is Karijini National Park. I can only put up a couple of photos, but for the more adventure-minded this is the park to come to. The ‘paths’ test you out physically and mentally. You have to climb over stuff holding your weight with your hands, you swim through water crossings, and you clamber through slippery waterways. It is amazing. 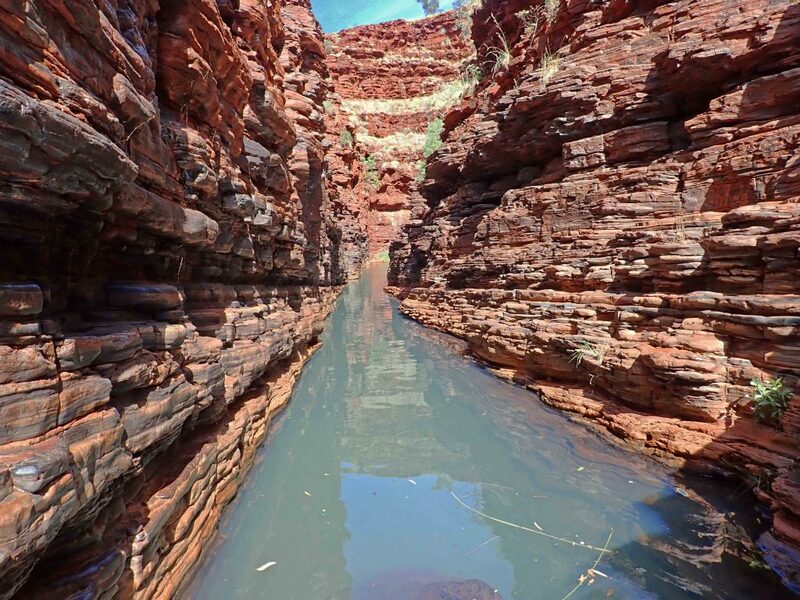 Karijini National Park – The Sheep Dip. Yes, that is the path. You had to swim. 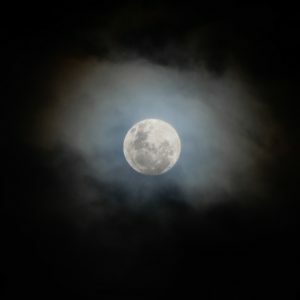 The other bonus is that it is so far out in the middle of nowhere that the night sky is unlike any you have ever seen. It was almost hard to make out the main constellations because there were so many other stars around them. It also made for very chilli nights, and this was where I discovered that my sleeping bag might have been exaggerating a little when it said it went down to -5°C. I literally woke up shivering. 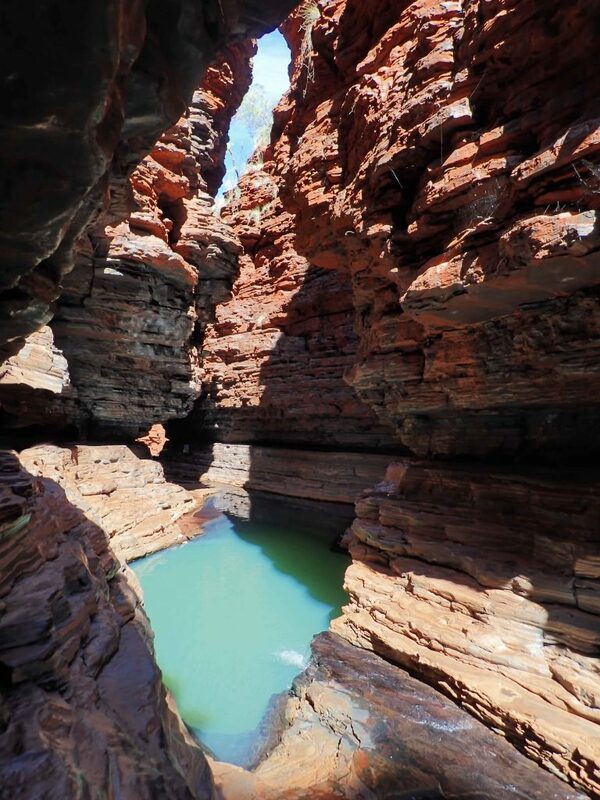 Karijini National Park – Kermit’s Pool. Yes, also the path. And that water was cold! From there we went to Broome, where I spent a few days, so I think I will give it a post all of its own. It seems crazy to try and cover Peth to Monkey Mia in one post, it’s hundreds of kilometres of travelling, but I can’t do a post for each day of the tour, or it would see us out to the end of the year. In an effort to cut out some I’ll skip Perth cover just some of what we did in along the way. 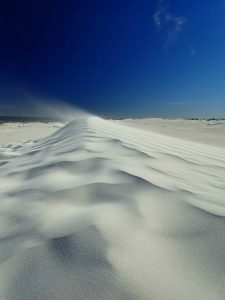 We hit the ground running, sandboarding down brilliant white sand dunes in Lancelin. This was the first test for my Tough camera as we got sand-blasted at every turn. It performed beautifully. After this tour, more than ever, I love my Olympus Tough tg-5. It puts up with a lot! Back on the road we then found ourselves at the Pinnacles. 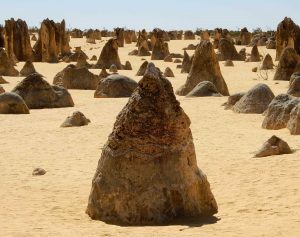 I’m sure most Australians have seen the Pinnacles, but what you might not realise is that no-one actually knows how they formed. Some say they are the remains of a petrified forest. To me they look more marine in origin, but right now we are all just guessing. Despite the many people (and cars) moving through them, they managed to hold a magical aura that was quite haunting. But this was a tour, so we were back on the road to burn away as many kilometres as possible. We stopped for the night in Kalbarri and then took off early for a quick romp through the national park. It seems a crime to speed through this, but we went to Murchison Gorge, Nature’s Window and Z-Bend Gorge. All stunning. Then on the road again to get to Monkey Mia just in time for sunset. 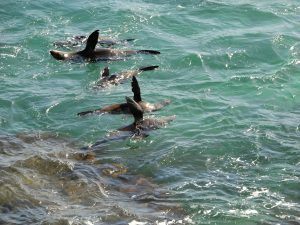 The next morning we ambled down to the beach and watched the dolphins come up to the shore. I was lucky enough to be picked out of the crowd to feed one. She didn’t take my fish -they thought she might be pregnant, so I shouldn’t take offense. 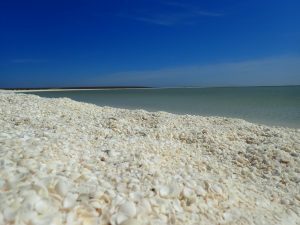 Then we were back on the bus to visit shell beach; a massive expanse of pure white beach made up entirely of shells. Apparently they are up to 10 metres deep! Next it was time for the main reason I found myself in WA. Hamelin Pool and the Stromatolites. These were the first life on earth, and the reason all the rest of life could follow. For many years they were thought only to exist in the fossil record, until Hamelin Pool was discovered. I must have taken at least 100 photos, and I did nearly cry. The significance of these bacterial communities cannot be stressed enough. 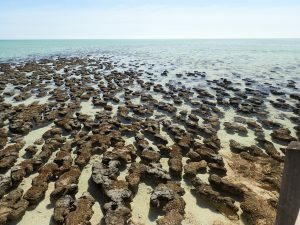 No stromatolites, no people. I just hoped my selfie there wasn’t documenting the creatures responsible for the start and end of life on the planet. Okay, I wasn’t just taking a digital holiday. I was having a holiday holiday as well. 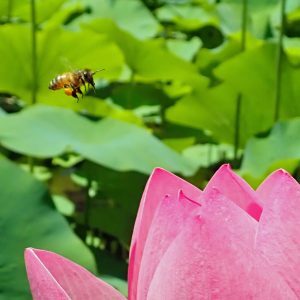 I have just spent the last month travelling from Perth to Darwin (nearly 10,000 kilometres) and it was one of the most amazing things I’ve ever done. The holiday tested me on many levels, pushing me to, and beyond, my limits. 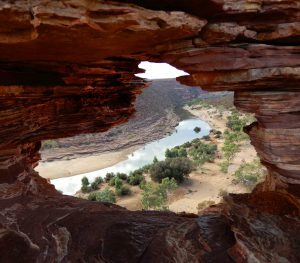 I swam with whalesharks, I clawed my way through the ravines of Karijini National park, and I sat up front in a helicopter with no doors and an amazing view of the Bungle Bungles. I also showered in hostels where I had to wash the ants down the drain before I could get in, I used public toilets where the stench of rotting faeces came over to hug you before you even opened the door, and I ate off dishes washed in cold water. I think my gut flora were tested too. I met lovely people. I saw beautiful, and terrifying, and wonderful things. I ticked items off my bucket list. I would do it all again in a heartbeat. But I am back to reality now. Work, cold, housework. All things that I could forget about for a while. So, over the next few weeks I’m going to share some of my trip with you in the hopes that it will inspire you to get away. I think we could all use a break from reality sometimes. 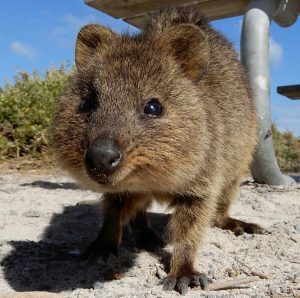 Here are some snaps from Rottnest Island, a 90-minute ferry ride from Perth, Western Australia.